I make a regular habit of walking in our gardens w/camera in hand, during the summer months. 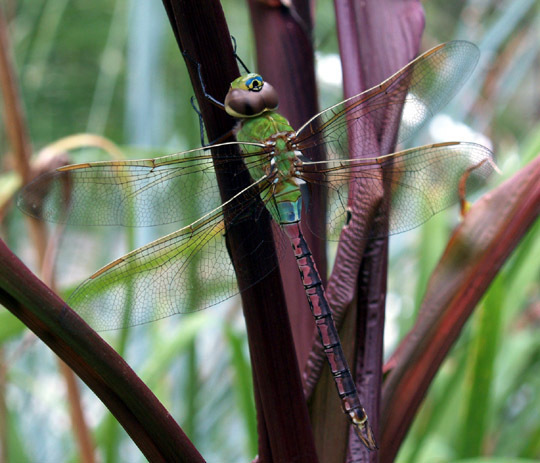 Nancy inspired me to post this lucky pic (from last summer) of a dragonfly showing off it's ability to blend with the environment, choosing to light on a plant of the same color scheme. Oh, wow..! That is beautiful..! And the clarity. Remember when images on the web were... gosh, I can't think of the work for it, bitmapped? well, broken up, pixelated? gifs. Anyway, thanks, it is a beautiful photo.